>> use of its deep trench capacitors to stabilize voltage. >> computation under exceptional conditions. > is a realistic idea. > cache and CPU core at the optimal point are pretty small, 0.45V vs.
> need your cache to basically run 2-4X faster than the CPU core. > That's not going to happen with such a small difference in Vcc. > design', although I'm not sure. As you noticed, I was not suggesting this; I was merely pointing to a paper that had suggested it. The paper does seem to be assuming 'normal circuit design', so SRAMs could be much faster. > far larger than the best case for async circuits. > latches, but nobody seems eager to use it given the complexity. Clockless (or clock-reduced) design does not seem to be a huge win (particularly relative to complexity and maturity of design and testing tools), but I was curious if the two techniques were compatible (say 25% power with NTV and 23% with NTV+async), synergistic (say 20% power with NTV+async), or conflicting (say 25% power or worse with NTV+async). Even a 5% additional benefit could be worth considerable complexity in some areas. 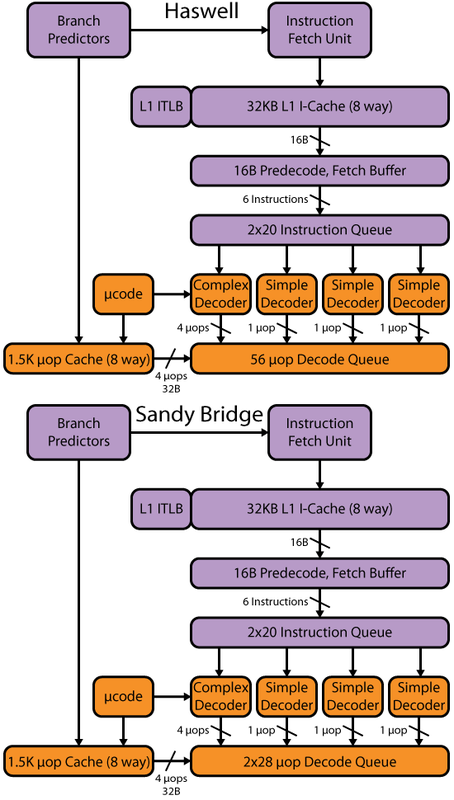 For the simple cores imagined for NTV (at least initially), async design might be somewhat less overwhelmingly complex.